Even our small footsteps impress with their exklusive design and add to our stool and step stool line. Small and space-saving - our footsteps are quickly accessible and will uplift you. For the production of the steps, we use only certified solid wood, preferably beech or walnut, from sustainable cultivation. With loving attention to detail, the NATUREHOME design footstool will be handcrafted in our factories. Then the solid wood is finished with vegan Furniture oil or it gets a colored coating with non-polluting, high-quality matt varnish water-based. The vegetable wood oil enhances the characteristic grain and gives your wood a natural wood protection small furniture"> small furniture . You are spoiled for choice between white, natural oiled, walnut oiled, red or black Since our healthy wooden furniture is made of natural materials, treated with harmless furniture oil or wood varnish, they do not sting pollutants like formaldehyde. This not only protects our environment, but also predestines our steps or footbases for use in the nursery and bedroom. To protect your wood and tile floors, our NATUREHOME small furniture made of solid wood is already bolted to our high-quality felt glides. The design concept of the treads was designed by the Berlin designer label Runner + Keichel . The linear and geometric shape with the circumferential groove of the treads can be found as well as in the series of treadmills again. 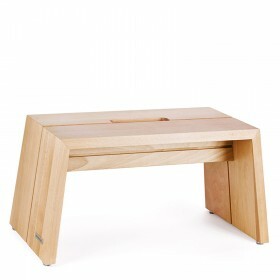 Our wooden footstool is an ideal complement to your already existing ecological NATUREHOME small furniture. Simple and elegant at the same time, our modern footstool can be integrated into various interiors and combined with various interior design styles. Like any of our occasional furniture, the Footstool is versatile. As a Solid wood side table , it offers plenty of space for newspapers and other small items you want to set aside on the fly. 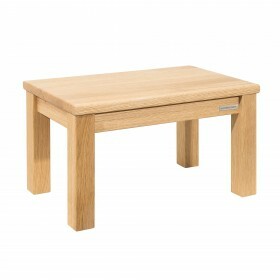 As a childrens furniture for the nursery, the step in combination with a kids' table provides a perfect sitting position as a children's bench. In the bathroom, she brings the children closer to the sink or in the kitchen the upper cupboards. Whether with or without carrying handle, the design footstool is easy to handle and can therefore be rearranged and used - as a stage, shelf or stool. It is always a stylish eye-catcher! What is the difference between step stool and step? The NATUREHOME team defines step stools or stepladders differently than the tread. Both terms have a different meaning. The step stools have at least two steps with us. These help you to reach high cupboards, books and co. Because of the practical height, the stepladder can also serve as a practical stool. The tread, however, has only one tread. But it also helps to get hold of something, but it also allows us to put our feet up.